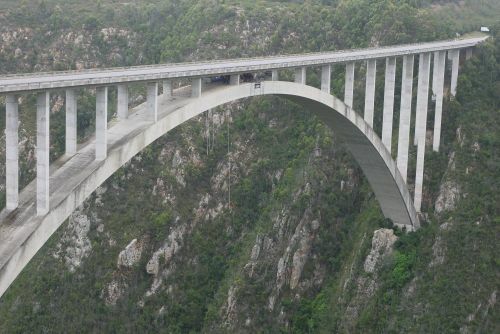 At 216 meters (709 feet), the bungee jump off the Bloukrans Bridge just outside Storms River, South Africa is the highest commercially operated bungee bridge in the world. So of course I had to do it. 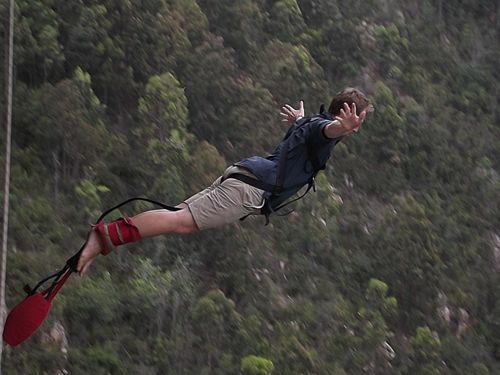 Bungee Jumping at Bloukrans was somewhat of an impulse decision. 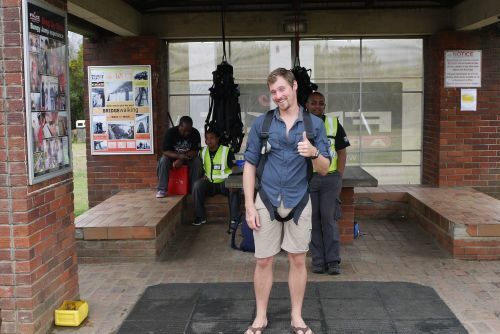 After passing up the opportunity to bungee at Victoria Falls, I was somewhat contemplating bungee jumping in South Africa prior to arrival. We were driving from Jeffreys Bay to Knysna that day. Alison was taking a short nap as we came up on Storms River. 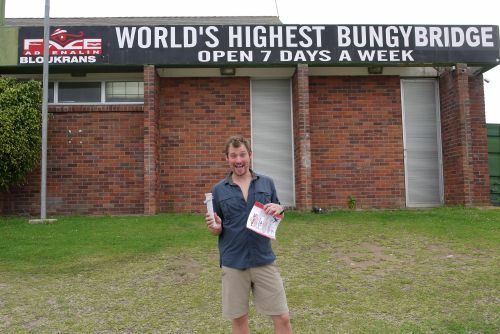 As we approached the signs indicating “bungee jump this way” I was debating whether or not I was up for the challenge. But I thought to myself – Here’s 2 Now, and jerked the wheel toward the exit. Alison awoke violently and was wondering what in the world was going on. Neither of us really processing what I was about to do, Alison desperately begged me not to do it. I somehow convinced her that everything would be fine (or at least all over quickly) and she reluctely jumped on board with the decision. 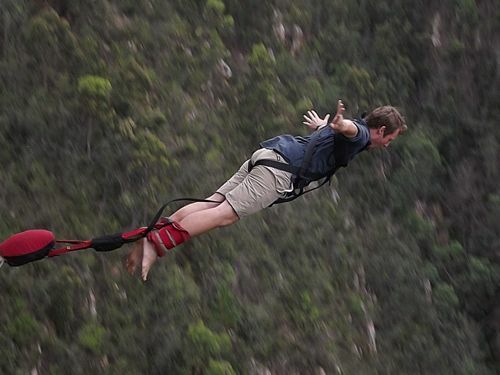 After observing the facilities at Face Adrenalin (http://www.faceadrenalin.com/), the operators of the bungee jump at Bloukrans Bridge, I was all that much more thankful that I didn’t jump at Victoria Falls, which was a dodgy at best by comparison. 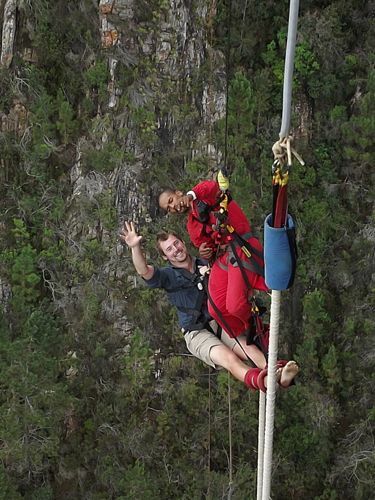 The people at Bloukrans and their pristine facilities and equipment made me feel very safe and well taken care of. 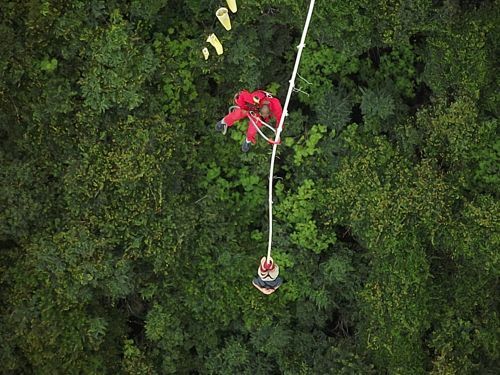 Given their 100% safety record, it was just that – safe. It was a whole 30 min from the time I pulled/jerked off the highway and was putting on my jump harness as my 2pm time slot approached. 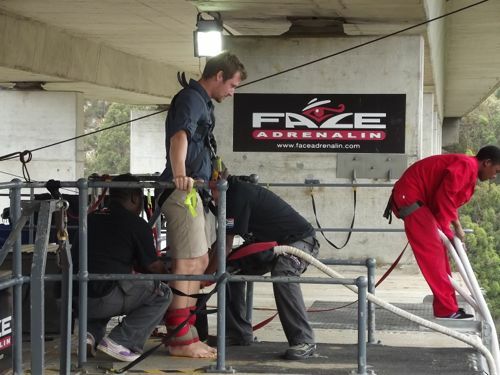 One of the nicer logistical details that Face Adrenaline does is to pair you with a staff person. Basically the same person that suits you up, is the same person that walks you out to the jump site, sends you over the edge, and the first person to great you on your way back up. That continuity surprisingly goes along way toward calming the nerves and making you feel safe and well looked after. As I approached the jump site, some high adrenaline high volume music was blasting loud enough to distract you from what you were about to do. 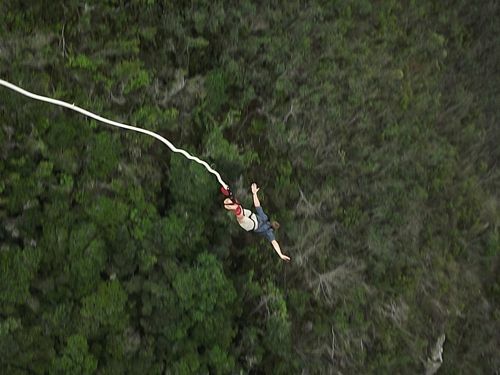 Given that were only two people in my jump group, as soon as we made it to the jump platform they were strapping the bungee harness around my ankles and securing that as well as a backup safety chord to my jump harness. It was over before I knew it. I remember swinging my arms instinctively as I initially fell. But half way into the jump you loose that sense of falling and just enjoy the rest of the ride down. 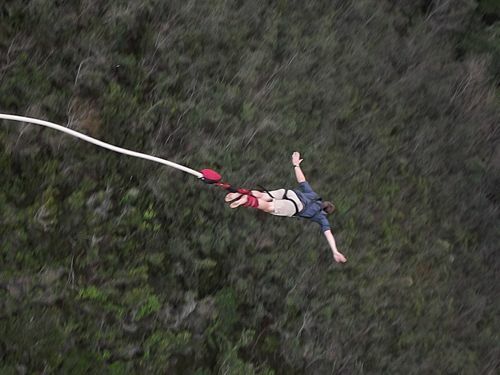 I was surprised to not feel any sort of jerk or snap as the bungee chord began to slow my descent. 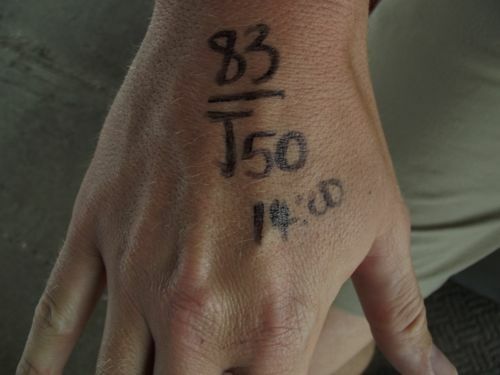 In fact the only way I knew I was about to reach bottom and was slowing down was the massive rush of blood to my face. Hanging upside down above a beautiful gorge that opened up into the ocean in the background was about as gorge-eous of a backdrop and setting that I could ask for, especially for my first (and probably only) bungee jump. 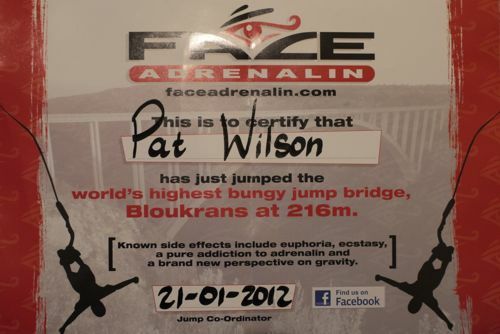 Three cheers for Bloukrans Bridge and Face Adrenaline for introducing me to the world of Bungee. You are out of your mind! Would you do it again? In your write up you say that the VF operation looked dodgy by comparison – I would be keen to understand what it was about the operation there that gave you that impression? I was planning to do a jump in Vf myself later this year. 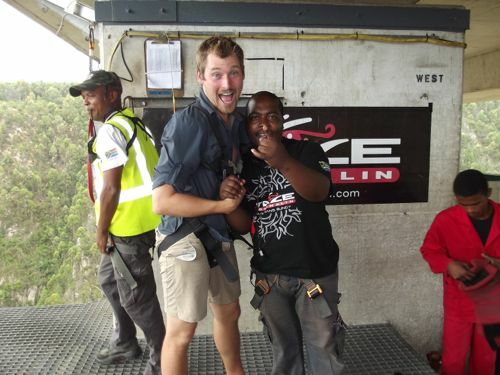 Pat, I am an agent in Livingstone selling the bridge activities and am quite surprised about your comments. We are really quite comfortable with selling Bungi here and they recently had a safety workshop where all the agents were invited to attend, which was most informative and looks like they have infact got better safety systems in place than other bungi operators! Perhaps you should contact them and ask them for comment on your above article if you think they are so dodgy? And perhaps get facts rather than writing what you’ve “heard” about. Thanks for your feedback but I have to stand by my words. 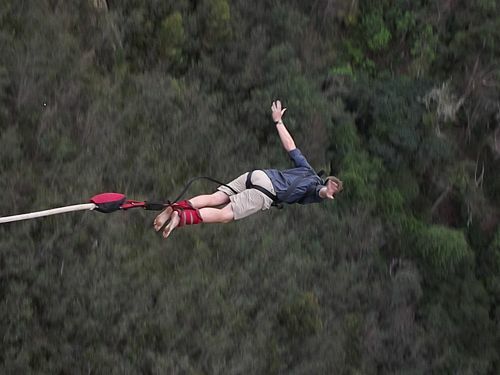 The bungee chord snap that happened at Victoria Falls on Dec 31, 2011 is not rumor – see the attached link to the news story with video: http://news.nationalpost.com/2012/01/08/video-bungee-jump-a-near-disaster-as-australian-woman-plunges-into-african-river/ . That fact alone makes it a “dodgy” jumping location in my opinion, especially compared to other jump locations with spotless safety records. Sorry you feel differently but again I stand by my words and my independent evaluation of the circumstances that I observed on the ground in person with my own eyes.